- The Greek flag is located on the back of the neck. 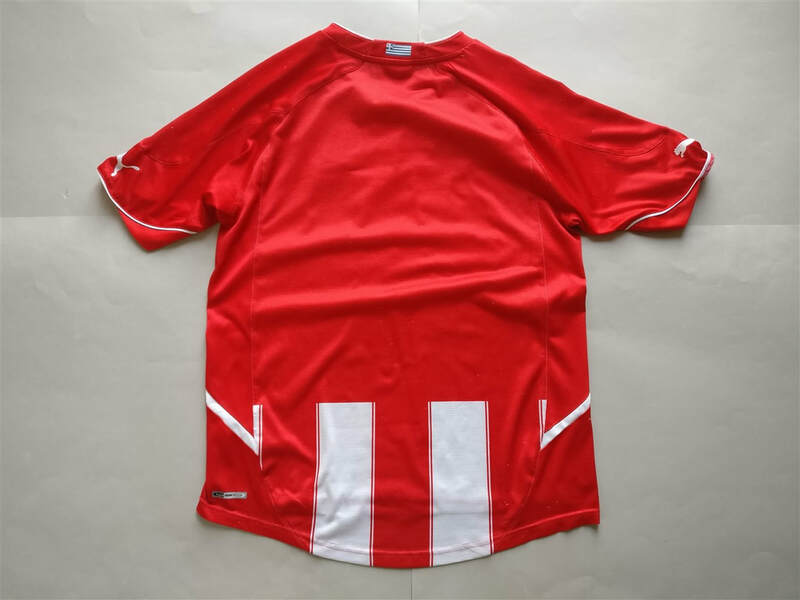 Another shirt that I no doubt bought from Sports Direct when they went through their phase of stocking shirts from clubs around Europe. This shirt doesn't instantly standout to me as a Puma shirt if you can ignore the logo. The feel of the material is different to most Puma shirts. This shirt has a more silky feel to it in comparison to most others. Traditionally, Olympiacos' main rival is Panathinaikos and their so-called derby of the eternal enemies is the classic rivalry in the Athens area and Greek football in general. The two teams are the most successful and most popular Greek football clubs, and the rivalry is also indicative of social, cultural and regional differences; Olympiacos is traditionally seen as the classic representative of the working class of the port city of Piraeus, while Panathinaikos is considered the club of the Athenian higher-class society, although nowadays this differentiation has weakened and the two clubs have similar fanbases.